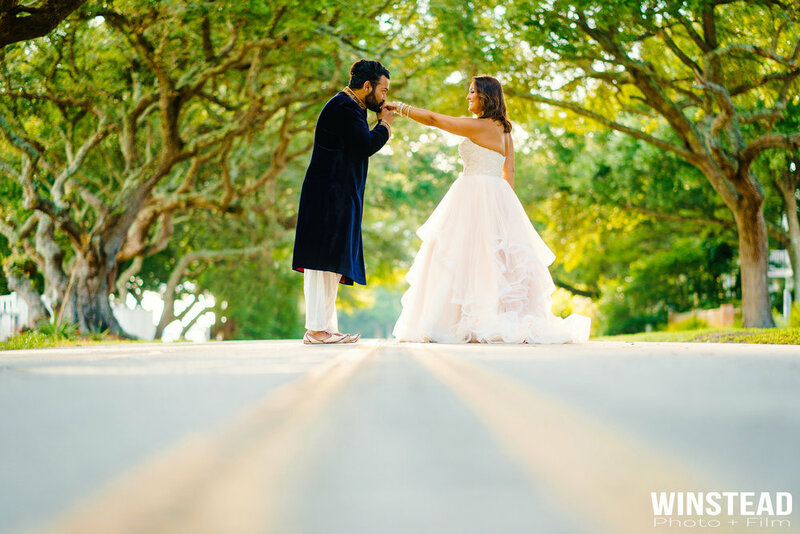 NC Wedding Photographers: Being a top NC wedding photographer, Chad Winstead Photography has a timeless and modern twist on capturing the candid, raw emotion of weddings through a variety of lighting approaches. Chad and Beth are professional wedding photographers and videographers serving NC weddings. They will put all his clients at ease during their wedding day. Often, clients don't even know he is in the same room! They travel all over to photograph weddings and portraits. You can feel confident in booking these professionals as your NC Wedding Photographers. Chad and Beth are lucky to live in such a great area that has so many fantastic venues and photography spots. Being NC Wedding Photographers has been one of the most rewarding careers as they have the opportunity to preserve timeless and treasured memories with his wedding images. Chad and Beth enjoy every minute of what they do. Chad and Beth want to capture your special moments with timeless and unique style, while you relax knowing that your pictures will turn out wonderful no matter what! Please take some time to check out how our vision of being NC Wedding Photographers and get in touch with us about capturing unqiue, artisitc photographs that will stand the test of time! Come to NC and choose us to be apart of your special day! Chad Winstead Photography will provide you with timeless and beautiful imagery that will stand the tests of time. We want you to look through your wedding photographs and be swept away with just as much emotion as you felt on your wedding day. We embrace capturing those little moments during a wedding day that you want to remember. It is all about getting that perfect shot! Every event can be challenging with different lighting, angles, or other obstacles to get in the way of a photographer. We take pride in overcoming obstacles that show up during a fast paced wedding, so we accept the challenge and go above and beyond to make each picture the best it can be! We give a laid back, easy going approach to photography so your wedding day can be the most enjoyable without the photography dictating your every move. We am there to help when you need guidance, but we make it fun and easy! You will not regret the decision to book Chad Winstead Photography to capture your NC Wedding! NC WEDDING PHOTOGRAPHERs : "WE ARE CHAD AND BETH, A HUSBAND AND WIFE TEAM BASED IN NC AND WE WANT TO CAPTURE YOUR STORY THAT REFLECTS THE TIMELESS AND BEAUTIFUL MEMORIES OF YOUR WEDDING DAY. SINCE 2013, WE HAVE BEEN STORYTELLERS; WHILE LIVING, CREATING, AND EXPERIENCING THE MOST PROFOUND AND EMOTIONAL MOMENTS IN OUR CLIENTS’ LIVES. WE HAVE PHOTOGRAPHED WEDDINGS ALL OVER THE CAROLINAS (EMERALD ISLE, NEW BERN, ATLANTIC BEACH, WILMINGTON, RALEIGH, CHARLESTON, AND CHARLOTTE ARE SOME OF OUR FAVORITES!) OUR GREATEST ACCOMPLISHMENTS ARE LIVING OUR DREAMS OF TELLING OUR CLIENTS’ STORIES THE WAY IT SHOULD BE TOLD: REAL, EMOTIONALLY-DRIVEN, DYNAMIC IMAGES OF AN EVENT AS UNIQUE AS YOU.